The segmented body with kicking tail creates a life-like swimming action like no other. 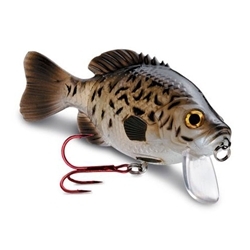 The Storm Kickin' Slab has a durable soft plastic body with a holographic insert and holographic 3D eye to create the real life flash of baitfish. Features a premium red #2 VMC treble hook and polycarbonate lip. With a slow-sinking action, the Kickin' Slab is 4" in length and 1-1/8oz.